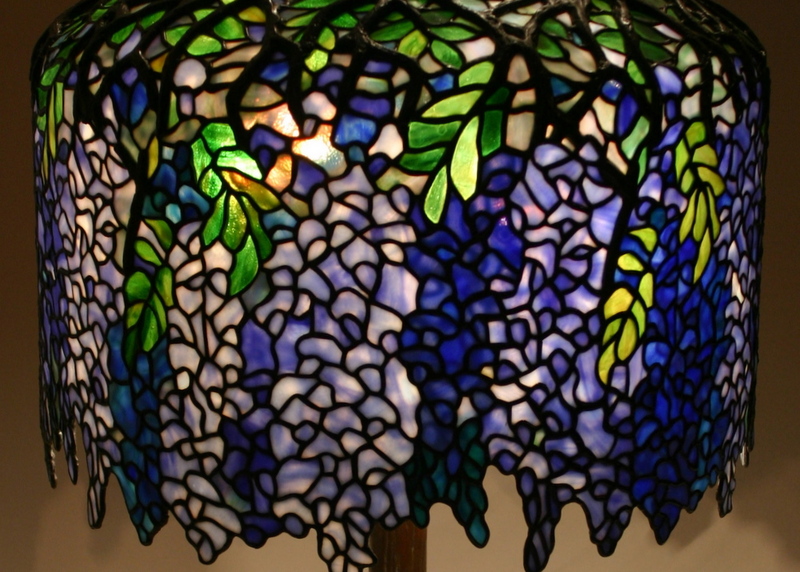 The Wisteria is one of the best known and cherished of all the Tiffany lampshades designs. 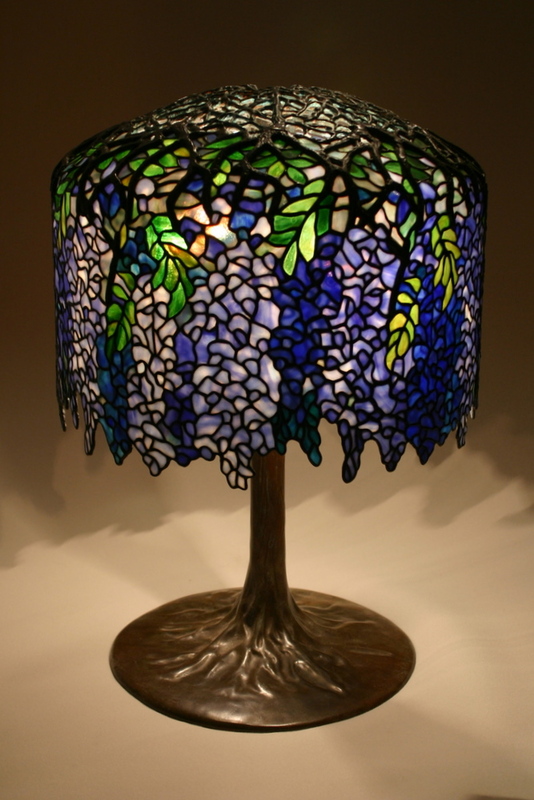 I made this lamp several years ago using Schlitz and Lins glass. In this shade the vine is represented in the shape of a tree form which is completed by the base that takes on the form of a tree trunk. The wisteria flowers hang in clusters from the plant and are rendered in shades of blue to an intense darker blue. 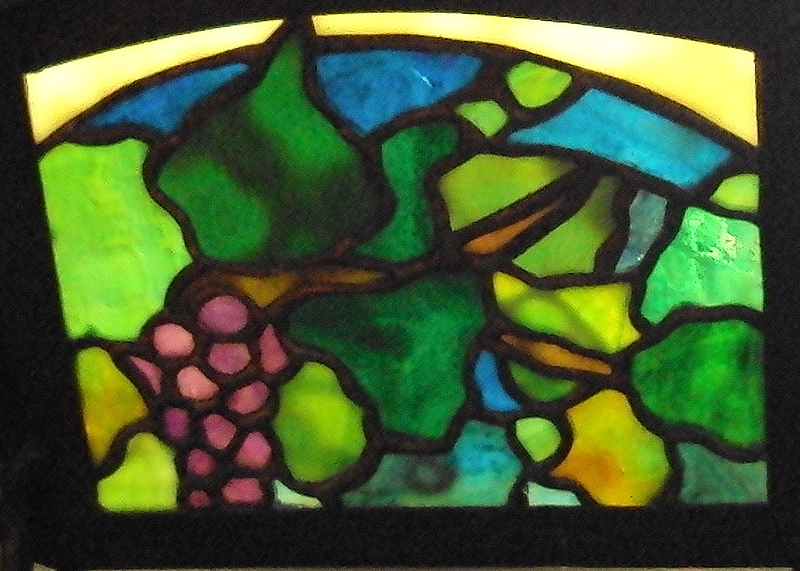 This is a unique Tiffany design as it has an irregular upper and lower border. In the top portion of the shade a heavy brass casting forms the crown of the tree form. The bottom border of the shade has an irregular border that outlines the clusters of flowers. Each of the 2000 pieces of art glass are individually selected, cut by hand, wrapped in copper foil and then soldered together. The metalwork has been finished in a bronze/green patina. It is signed on the inside of the shade with my signature. The shades diameter is 18″ and the overall height is 25″. The base is solid brass with a green brown patina made by Odyssey. Wishing you a very special Holiday Season and a Happy New Years! 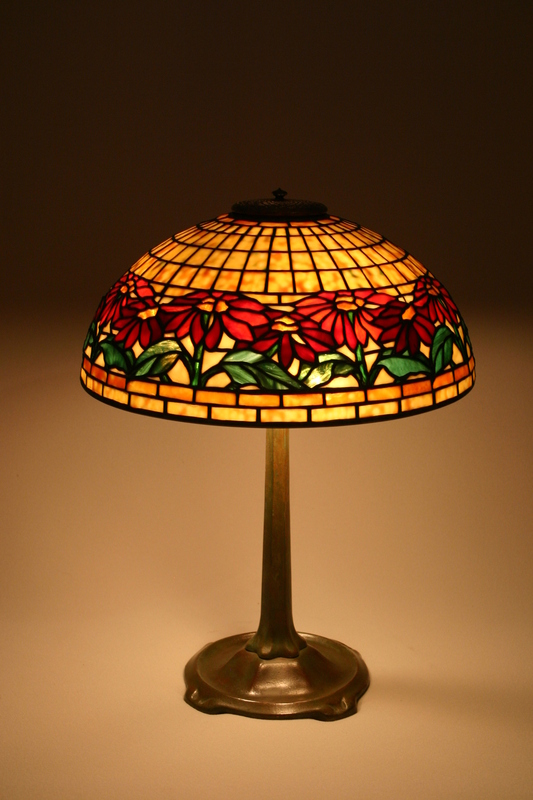 Tiffany Reproduction Poinsettia Lampshade on Small Stick Base, available for purchase $1400. On this project for a client in Minneapolis, I created a orginal grape-vine design to fit in an Antique French handmade light fixture. The iron work had a scrolling pattern that coordinates nicely with the organic lines of grape vines. The design and glass were inspired to have the feel of Tiffany lampshades created in the early 1900’s which I’m guessing is about the age of the fixture. On the bottom of the fixture I created a glass sheet from glass powders in my kiln that has a crackle pattern to it that diffuses the light. I learned this technique from a Canadian Artist Robert Leatherbarrow. 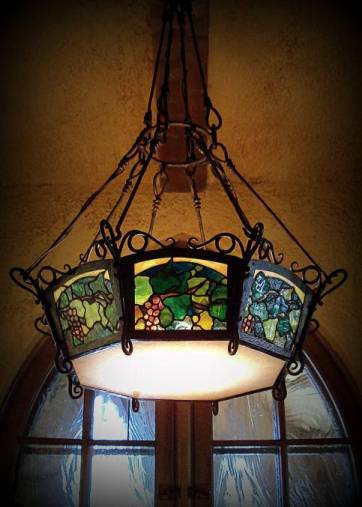 This is the first project I combined this technique with a stained glass project and it seem to work well with the feel of the ironwork. I really enjoyed reworking an existing old fixture and give it a new look to it, it has found its home in a beautiful Tutor Styled home. This lampshade is a reproduction of an original Tiffany Jonquil Daffodil 20″ diameter shade. I have selected glass in shades of a warm yellow to amber tones for the flowers. The background glass is a rich aqua color that varies in light to dark tones. 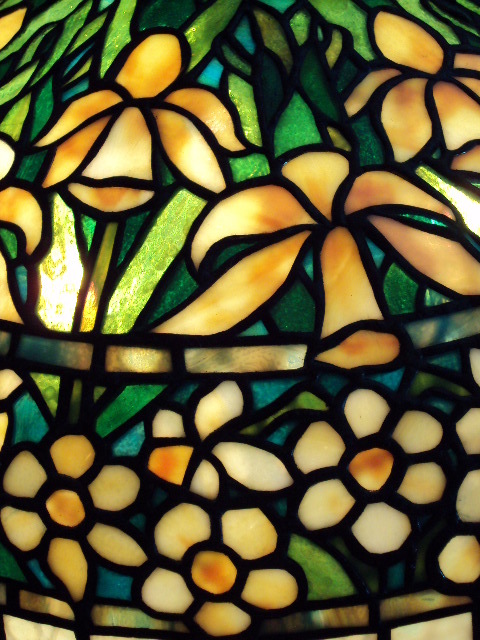 It is a rather unusual Tiffany design as it has two different flowers in one shade. The daffodil is represented at the top and the jonquil fills the band of flowers toward the bottom. 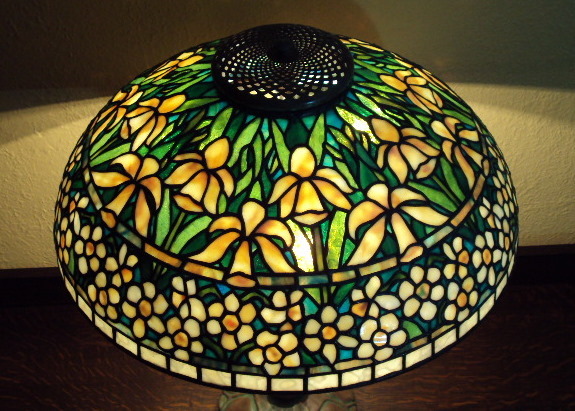 The shade is shown on a reproduction Tiffany Mock Turtle base. Height of the finished lamp is 23″.